Presented by Humanities, Nebraska, The Nebraska Cultural Endowment as part of the Humanities Nebraska speaker series. 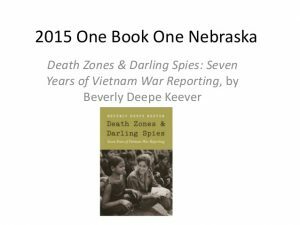 In her book Beverly Keever champions women as capable war correspondents and trounces the misconception that the American press “lost” the war. Dr. Berg discusses Keever’s exploration of the war’s poorly understood and under-appreciated earliest years, and how she demonstrates that the president and his advisers—by hubris, ignorance, and choice—missed significant opportunities to understand and fight the war.